voluntary contributions received by a trust created wholly or partly for charitable or religious purposes or by an institution established wholly or partly for such purposes, or by an association or institution referred to in clause (21) or clause (23), or by a fund or trust or institution referred to in sub-clause (iv) or sub-clause (v) or by any university or other educational institution referred to in sub-clause (iiiad) or sub-clause (vi) or by any hospital or other institution referred to in sub-clause (iiiae) or sub-clause (via) of clause (23C), of section 10 or by an electoral trust. the subsidy or grant by the Central Government for the purpose of the corpus of a trust or institution established by the Central Government or a State Government, as the case may be. 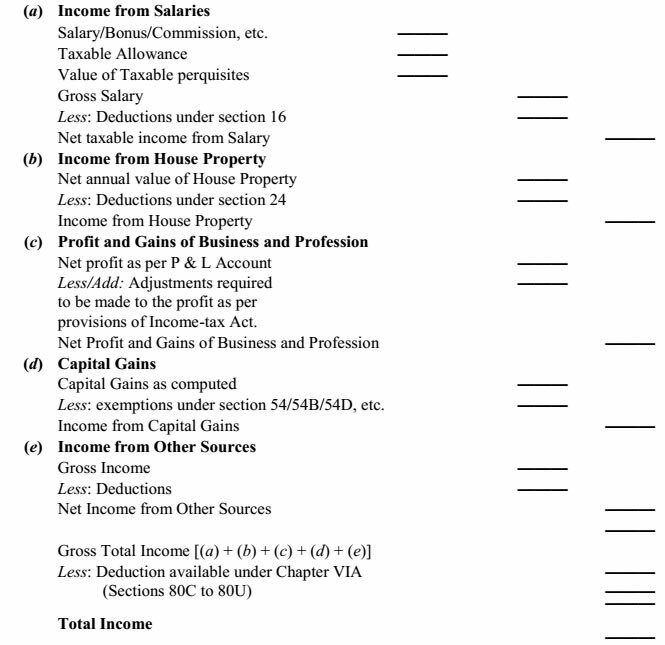 The total income of an assessee is computed by deducting from the gross total income, all deductions permissible under Chapter VIA of the Income-tax Act i.e., deductions under sections 80C to 80U. Determine the residential status of the assessee to find out which income is to be included in the computation of his Total Income. Classify the income under each of the following five heads. Compute the income under each head after allowing the deductions prescribed for each head of income. The total income, as computed above, shall be rounded off to the nearest multiple of ten rupees and for this purpose any part of a rupee consisting of paise shall be ignored. Thereafter if such amount is not a multiple of ten, then, if the last figure is 5 or more, the amount shall be increased to the next higher multiple of 10 and if the last figure of Total Income is less than 5, the amount shall be reduced to the next lower multiple of 10. For example, if the total income is Rs. 8,79,467, it shall be rounded off to Rs. 8,79,470 and if it is Rs. 8,79,464.90, it shall be rounded off to Rs. 8,79,460. On the Total Income, tax is calculated according to the normal rates prescribed under the relevant Finance Act and special rates prescribed in the Income Tax Act. The amount so computed, shall be increased by a surcharge, if applicable and education cess calculated @ 2% + SHEC @ 1% of (tax + surcharge if any). The amount so arrived at is the tax liability of the person for that year. W.e.f. A.Y. 2010-11, the surcharge was applicable only in case of a company assessee. However, w.e.f. A.Y. 2014-15 surcharge has been made applicable to all assessees provided the total income of the assessee exceeds the specified amount. 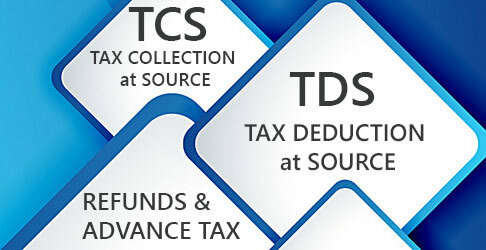 The amount of tax (including tax deductible at source or payable in advance), interest, penalty, fine or any other sum payable, and the amount of refund due, under the provisions of the Income-tax Act, shall be rounded off to the nearest multiple of ten rupees and, for this purpose, where such amount contains a part of ten rupees then, if such part is five rupees or more, it shall be increased to ten rupees and if such part is less than five rupees it shall be ignored. Income from all these heads shall be computed separately according to the provisions given in the Act. Income computed under these heads shall be aggregated after adjusting past and present losses and the total so arrived at is known as ‘Gross Total Income’. 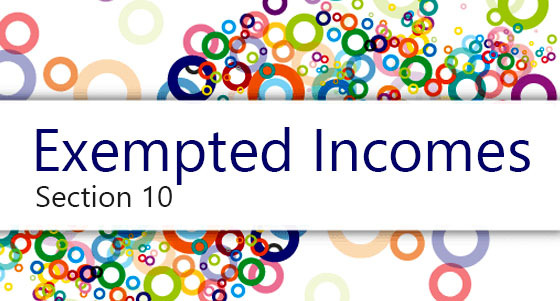 Out of Gross Total Income, Income-tax Act 1961 allows certain deductions under section 80. After allowing these deductions the figure which we arrive at is called ‘Total Income’ and on this figure tax liability is computed at the prescribed rates. These five heads of income are water tight compartments. Income from one source of Income, which is to be included in a particular head, cannot be included in any other head. Each head of income has its own deductions. After computing income from various sources of income within a particular head its own deductions are allowed and thus we arrive at income from that head. (See Chart on page 2/2).